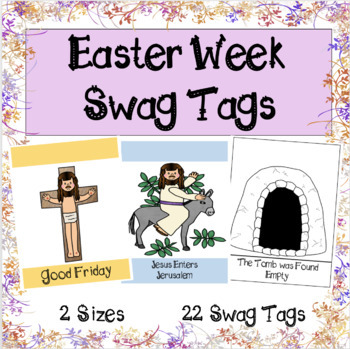 Swag tags for Easter Week / Holy Week. 2 sizes small (1.5"x2") and large (2"x2.5"). There are a total of 22 swag tags in color and black and white. Black and white is great for students to color on or to print on construction paper. For individual classroom use only. You can buy additional licenses at my TPT store for a discounted price. Purchasing this product does not give you the rights to it. Do not sell these please. Cannot be used for commercial use.